NEWS UPDATE: Journalists are now telling us that scientists are saying something about “the end is near,” but they can’t quite make out exactly what the scientists are saying because they are so hopelessly confusing and boring. 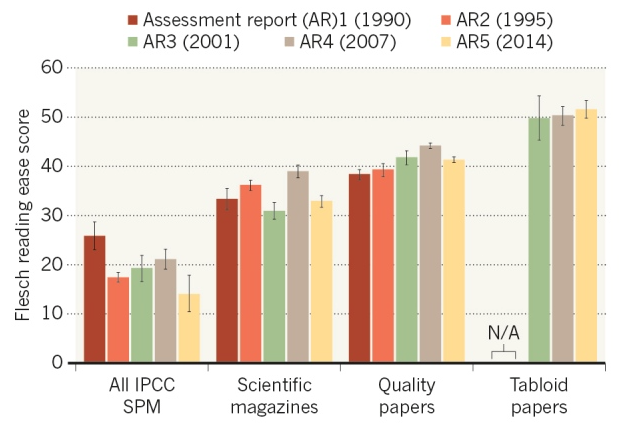 A report last week in Nature says communication by the IPCC has gotten worse over the past decade, not better. The IPCC needs the ABTFramework. We are now propagating the ABT approach at USDA (I’ll be running another two Story Circles next month). One science group has already used the ABT to fix their statement to the upcoming Paris climate meetings. People have been complaining about the poor communication efforts of the IPCC for years (John Sterman had a note about it in Science in 2008). They need the ABT Framework. Actually, so does the Flesch-Kincaid Readability Test, developed in 1975 (it’s 2015, we now know things about the importance of narrative structure). Come on, everybody, we can do better than this. INCREDIBLY PERMANENT COMMUNICATION CHAOS (IPCC). Apparently the journalists are getting better at communication as the IPCC gets worse. What a great way to watch the world end — journalists telling us really clearly that they can’t understand what the scientists are saying. It was 2008 when my good friend John Sterman had his MIT math and science grad students read the executive summary of the last IPCC report and try to translate it into understandable language. In so doing, about half of them got wrong the basic contents of what the summary was saying. He published a great short essay about it in Science, saying if MIT grad students can’t understand what you’re saying, how do you expect the public to. You would have thought the IPCC might have improved things in response to being called out. Not even close. Really? This is serious business. And no, it doesn’t work to let the science folks communicate poorly just because you think the journalists are some sort of miracle workers. Ever hear the expression “Garbage in, garbage out”? If the process starts with garbage communication, you’re going to run a substantial risk of ending up with something being wrong down the line. It’s kind of like the old Telephone Game. Honestly. So just last week a scientist told me about a committee of 20 people from a scientific organization he’s part of, putting together their climate statement for the upcoming Paris climate meetings. They had a classic case of “herding cats” with everyone wanting their separate message to be part of the statement. But he stepped in with the ABT, and bingo — they came up with a clear, easy to read 6 paragraph statement with solid ABT structure. It has two simple paragraphs of set up, one paragraph that lays out a single narrative direction, then the remaining paragraphs of consequence and action needed. Yes, it is that seemingly simple, though doing it skillfully takes time and training. The IPCC doesn’t need to be hopeless (unlike what Oppenheimer is suggesting). It just needs the ABT Framework.